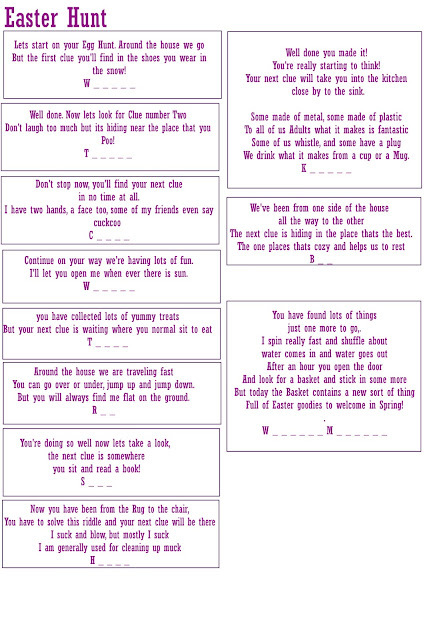 This is me Sarah mum of 3: Fun Easter Egg Hunt - Print out! 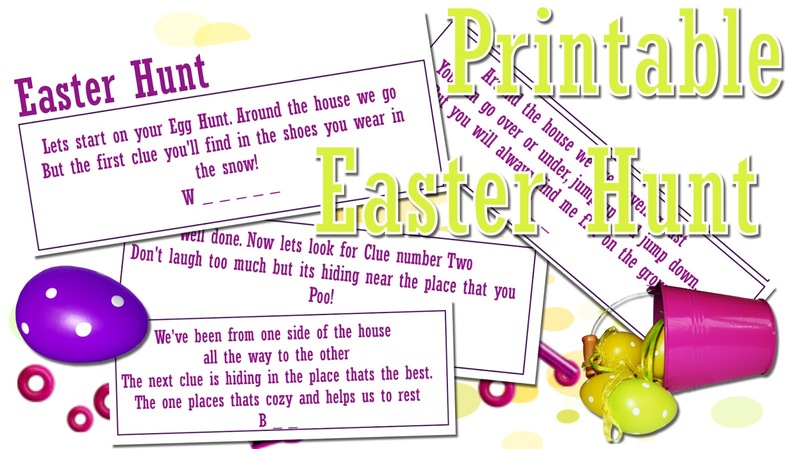 Fun Easter Egg Hunt - Print out! I love to do treasure hunts, they are a great boredom buster, but Easter is a perfect excuse to set up a really fun Treasure hunt, which takes only a few minutes to set up but can provide loads of fun! This year the weather may not be good enough to do a hunt in the garden, so instead I am going to set up a treasure hunt inside for the children to follow in order to find their Easter Gifts. I have wrote out a series of riddle style clues which take the children from one place to the next, each time they follow the clue correctly they will find the next clue and a couple of small chocolates. When they have completed the whole challenge they will come to their main Easter Gift. 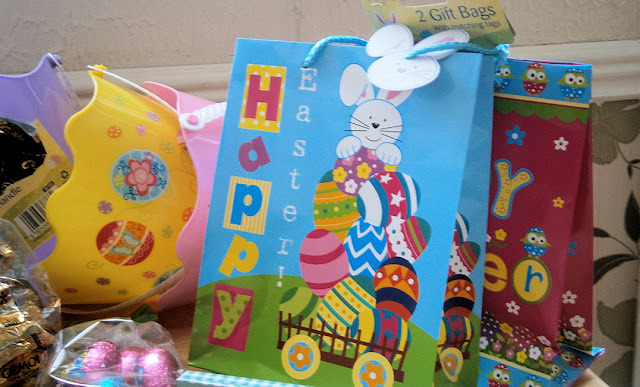 This style of Easter Egg hunt is so quick and easy to get organised and is very cheap, all you need is some paper for the clues, maybe a bucket or goodie bag and a few chocolate surprises. 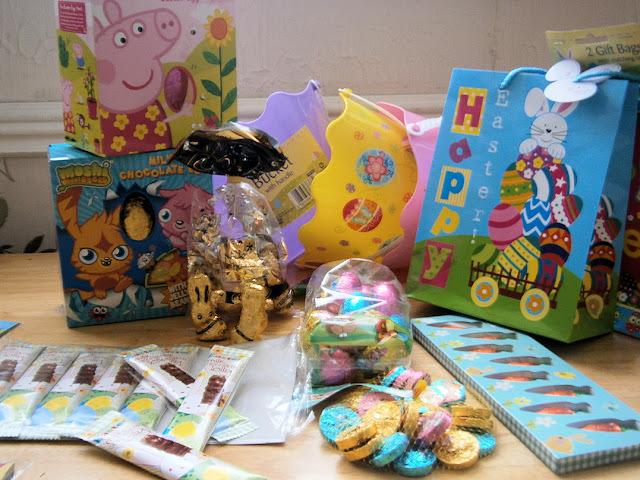 We went along to Poundland to see their amazing selection of Easter Eggs and Chocolate treats, as their ambassadors we were sent some vouchers to help us put on our Easter Hunt. Poundland had a great range of cheap Easter gifts with lots of lovely baskets and goodie bags which are perfect for this type of Easter hunt. 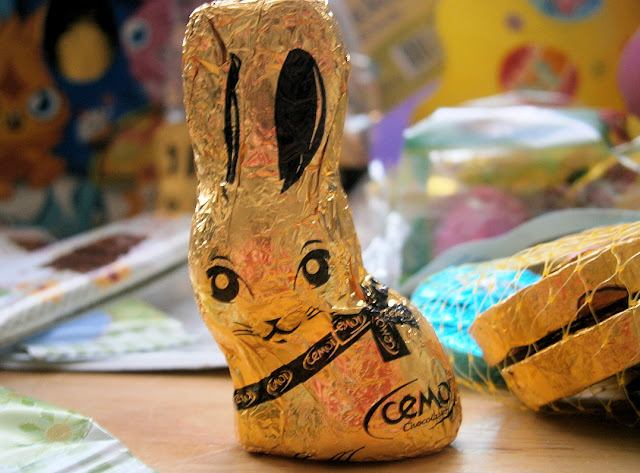 They have a great range of Large Easter Eggs for the final Prize, and lots of little chocolates to place around the house along with your clues. The children always really enjoy solving the riddles and running along from one place to the next, it helps build team work too as they take it in turns to read out the clue when they get to the next spot, filling up their goodie bags as they go along. We picked up some goodie bags from Poundland 2 bags for £1 and some plastic buckets for £1 each, we also brought some choclate bunnies, Easter lollies and hollow eggs, so we have loads of surprises to places along our treasure hunt so we could invite the cousins along and have plenty of supplies. If you are thinking of having a Easter Treasure hunt and are struggling to think up riddles as clues here is a free printable page with the clues I have wrote out to use this year in preparation for our Easter Egg hunt, you can download this by Right clicking on the image and then selecting 'Save Image As' and then printing it from your computer, or you can simply copy out the riddles by hand. The Treasure hunt clues take the children all over the house, and are all easy enough for different aged children to solve. I have put them in order so they have to go from one end of our house to another without having too many close together, which means the children take abit longer and don't spot the next clue before they have solved the riddle! But you can jumble the clues up to suit your own house, The first clue takes them to the Shoe cupboard to find their wellingtons as I thought this was fitting seems as we have had such snowy weather recently! Then They are taken to the toilet, and then to the clock... and so on and so forth, The last message is taking them to the washing machine and washing basket which will be where their big Eggs are hiding. Do you do hunts like this with your children? Thanks Angela it is a fun activity even if no prizes are included! Typists parents once did that for her and her sister! The woke up to the clues taped to the side of the bunk beds, but each of them only had half the clue so they had to work together to figure them out and help find each others easter eggs (As each egg was marked up as who it was for!) It was fab!! That sounds like a perfect way to instill some sharing between siblings making them appreciate that teamwork is often best! Hi Sarah, your easter egg hunt post has really helped me today! I was panicking as I need to organise one ready for tomorrow afternoon and was wondering what sort of clues to put together and also how long it was going to take me to write them all out. Your print out has just made it so much easier. Thanks again! Glad you enjoyed the post and I hope the hunt goes well tomorrow! hi, what sort of printable things are you looking for? if your in the UK poundland do a Easter egg hunt kit as well which includes numbered eggs to find, you can use anything at all as prizes, haribo bags of sweet, kids lollipops and even hoe made rice krispir cakes with mini egg on top.. easy to make and great treat to find at the end of the hunt! you can make paper chains to decorate, they are quick and simple, you can draw big eggs on plain paper and get the kids to colour them in however they like? you can also paint hard boiled eggs, you could have a hunt which takes eqach children to a desginated activity, so maybe take them to the kitchen to find eggs in the cupboard, then to the art supplies t find the paint, then to the bathroom for a cup of water.. then at the end paint the eggs?! hope you think up something which entertains everyone and you have lots of fun! thanks sarah i have been to poundland and found some things so thanks for the idea. making a paperchain would be lovely and we could all do it together. My child is diabetic so could you think of anything you could come up with for prizes.And also can you tell me some good games that we could play as i cant go shopping now as i need to start preapering for the hunt. Can you tell me good hiding places to hide the gifts and also how to put the clues. I am looking for anything good for an easter egg hunt such as a map or anything fun. Hope you enjoy this Easter and i hope you can get back to me as soon a possible. how old are your children? if you print out my clues that are above, then you can put the first one in the easter basket, or bag that you give to the child at the start of the hunt, or tape this to the door of their bedroom or somewhere they will instantly see it on waking up if you want them to do the hunt first thing in the morning this clue reads 'Lets start on your egg hunt, around the house we go, but your first clue you will find in the shoes you wear in the snow' so without your children knowing or seeing you plan ahead and place the second clue in the wellies, which is where the first clue leads. following down the left side of the print out in order, you put the third clue in the toilet, then in the clock, then by the window, then at the table, then under the rug, then near the sofa or seat, then near the hoover, then the kettle, then the bed, then the washing machine is where you place the final thing. I tried to think up these clues to lead to places that most houses have, you can of course remove one if you don't have a hoover for example. As for treats at each stop, depending on the age of the children, and concidering your son is diabetic,and what you may or may not have available now, you could put colouring sheets and crayons at the table, you could put a yoyo or bouncy balls, blowing bubbles, or simply nothing at all and just the next clue along with some easter decorations, in the general area of the clue as a hint. children love to solve the riddles and thats what is most fun, not the gifts they are just a nice extra, I just put a little chocolate egg, well three because i have three children, at each stop, so I put three eggs in the shoe cupboard, inside different shoes, when they work out the first riddle they all go to the cupboard and look for the egg and the next clue, a different child reads out the next clue to encourage them to work together and the person who reads out the clue has to lead them to the next stop. you could have as the final prize some homemade cakes or whatever easter gift you have already brought, anything you brought from poundland if you brought some of the decorations then just place these around to make things look nice. Hope this is helpful, if you want anymore info or me to make you up a quick print out sheet for your children to colour in, then please do say, but it would be handy t have an email address so I can ensure you get the message and save you not having to check back here on my blog for updates. I hope you have a wonderful Easter whatever you decided to do. thanks for the message it will really help. Ihave only 1 child who is nine and has diabetes who is a girl. thanks once again do you think i should do a map and clues. Today we went on an easter egg hunt at clarmont landscape garden so i will also try to find to find some things of there. Hppy easter hope you enjoy your day. thanks i will probaly do the map and also do it as hard as possible as she wanted me to do the hunt hard. how do you think i should draw the map and send it out. do you know any good websites that would do printable easter egg hunt things as that woulld be useful. i hope you have a lovely easter and enjoy your easter egg hunt. 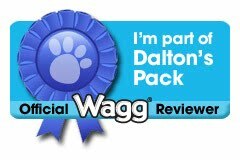 thanks for the websites. Ididnt have time to do that but i will still probaly hide choco eggs still because we had an easter egg hunt yesterday. This is absolutely brilliant! THANK YOU SO MUCH for sharing your idea and even better, providing a printable of the clues!!! Printing now!